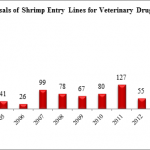 As the charts below demonstrate, over the last six years, RASFF notifications regarding shrimp contaminated by antibiotics have been dominated by imports sourced from India and Vietnam. 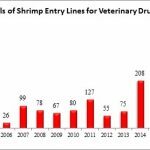 Over the same time period, the vast majority of imported shrimp rejections in Japan because of the presence of banned antibiotics have been of products sourced from Vietnam and India. And, for the United States, other than the substantial entry lines of Malaysian shrimp refused while that country acted as a conduit for transshipped Chinese shrimp, the second and third largest sources of refusals were India and Vietnam. 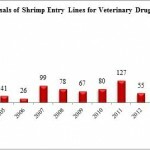 Nevertheless, despite the consistency of reporting across jurisdictions regarding the risk presented by sourcing from these two countries, there appears to be little tangible evidence of meaningful actions taken to address the continued use of antibiotics in shrimp aquaculture in India and Vietnam. Instead, recent reports from these countries indicate that shrimp exporters claim that efforts to prevent the importation of contaminated shrimp are disguised protectionist measures. The data made available by the Southern Shrimp Alliance establishes that there is no basis for such claims. Instead, refusal data from the European Union, Japan, and the United States demonstrate that actions taken to counter the presence of banned antibiotics and antimicrobials in shrimp imports has been limited only to those countries that have declined to eliminate the use of these drugs in their aquaculture. Notably, major shrimp producing countries such as Ecuador, Indonesia, and Thailand are largely unaffected by import refusals. The data released by the Southern Shrimp Alliance also belie claims that refusals result from regulator’s “chase of zero.” Both the European Union and Japan report the type of antimicrobial identified as being present in the imported shrimp and the amount of that compound that was detected.